So Japan Beauty Week is over, and boy, what an experience it was! Kelly and I, who both had the chance to test-drive the Suzuki Swift through one weekend before Japan Beauty Week, were invited on stage to share our experiences driving the car, and why we think it is a 'women-friendly' car. We didn't colour-co-ordinate our outfits! They had a beautiful white Swift next to the stage whilst we were talking, and it was decorated with Sakura blossoms - which actually tied into a competition that Suzuki had going on during Japan Beauty Week. 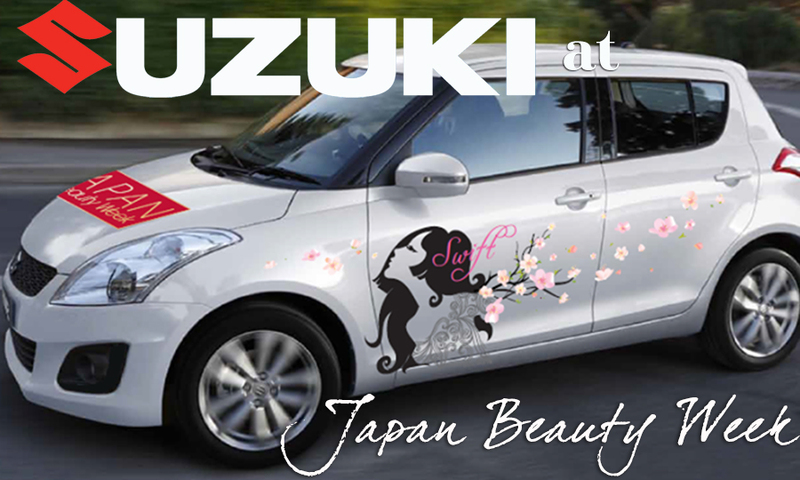 Whomever guessed correctly the number of Sakura blossoms on the Swift would win a Suzuki prize pack. Sadly, I wasn't there when the winner was announced, but I definitely tried once or twice to count the number of flowers without crawling all over the car! You can see the beautiful white Suzuki Swift just off to the left of this picture of Kelly and I with our gorgeous emcee, Kaylee. We spoke a lot about how compact the car is, and how it is extremely easy to drive around the streets of Malaysia, and to park on the streets of Malaysia as well. It is a fabulous little car, and it's perfect for beginners as well as ladies who want ease of use with a car, particularly around the jam-packed streets of Malaysia. One thing I do have to say against the car is that I wish it had a hybrid version, because that would make it even more fuel-efficient, and I'd have the whole package in a little car. Kelly loved how small and easy to drive it was for her, and I loved the big mirrors and double-unlocking features. For a full review of the car, click here.